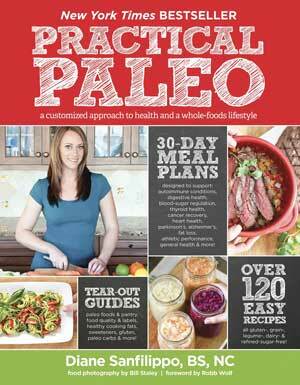 Practical Paleo is not just another large-format, beautiful full-size picture recipe book. (Even though it is!) Diane Sanfilippo has taken her knowledge and study of the Paleo Diet Lifestyle and organized into a work of art. This book has so many treasures. Diane Sanfilippo is a certified nutrition consultant, from New York, who received her nutrition degree at Sonoma County’s Bauman College. She has an amazing website called Balanced Bites. I will try to let you know why I find this book a must-read or a good addition to your library. I love this list! It is a great summary to use when you are in an elevator and need to explain the Paleo lifestyle quickly! 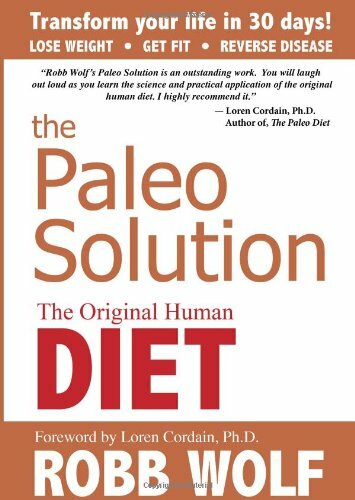 The rest of Part 1 consists of a guide to the basics of eating paleo. It includes a one page guides which are duplicated in the back of the book on tear out sheets. If you are new to the paleo diet you can laminate them and keep them in your kitchen or take them to the store with you. Diane includes detailed suggestions on how to shop so you are not spending a lot of money and how to eat paleo when you are in a restaurant or traveling. My favorite section in Part 1 of Practical Paleo is where Diane explains what can go wrong in our bodies if we do not eat the paleo diet. The illustrations are helpful but special mention must go to the guide to poop! It is great way to explain what can be a disgusting subject! The meal plans include what to add to your diet as well as what to avoid for each condition. Diane also gives a list of recommended supplements and herbs to consider included the foods that contain them. Then there is an easy to read, 30 day menu with recipes from Part III of the book. The recipe section begins with some great “how-to-cook” guides. How to chop, how to make spice blends, how to make bone broth, how to cook bacon, how to clarify ghee and how to ferment sauerkraut. This section what I needed when I started on paleo and wondered about all these things. I have tried several of the recipes including the buffalo chicken lettuce wraps, the lemon roasted romanesco, and the brussels sprouts with fennel. As I finish this post my eyes glance at the last recipe in the book, flourless mocha-bacon brownies. I’m off to make that recipe now! This book is $39.95 at Copperfield’s. Support your local bookseller! You can also check it out at the Sonoma County Library! And if you just have to have it at a reduced price it is $22.69+shipping at Amazon.com.